Vinyl Fence America is our custom design and installation company. The company is headed by Eddie Dossey, a licensed California Fence Contractor who has been working with vinyl material since 1989. Having designed and engineered the first 100% Vinyl patio cover system in the United States, Dossey is a pioneer in the vinyl industry. Dossey was also the first person to weld vinyl gates, as evidenced by our Westlake Village installation done nearly 15 years ago. A vinyl fence is installed much like a wood or wrought iron fence. However, most companies carry “fence-in-a-box” programs which are pre-cut and pre-routed components. “Fence-in-a-box” companies are restricted in their design and application of the vinyl fence because everything is already precut. It is like trying to put a square peg in a round hole. The pre-assembled sections come in either 6’ or 8’ widths. This doesn’t allow for much flexibility when a custom incline installation is required, or when a job requires proportional sections. 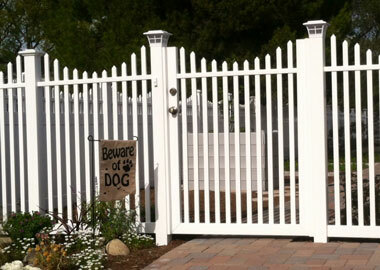 Fortunately, Vinyl Fence America’s association with Vinyl Mart Depot allows custom fabrication of each order. That means that Vinyl Fence America does not make your vinyl fence, gate, arbor, patio cover or railing until you order it. With Vinyl Fence America, we understand that no two jobs are alike. Therefore, we stock vinyl profiles in 7’, 8’, 12’, 16’ and 20’ lengths. This allows us more flexibility to properly install a vinyl fence on that incline in your backyard and make a picket fence in your front yard. 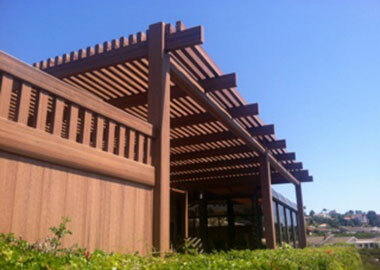 Being a fabricator also allows Vinyl Fence America to produce custom heights, widths, designs and styles. 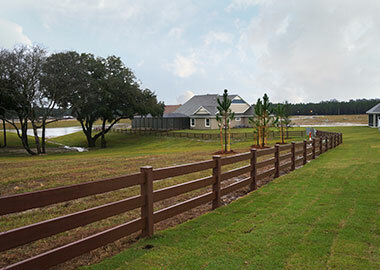 Like a wood fence, vinyl fence posts are installed in a concrete footing in the ground. However, unlike wood, vinyl is flexible. The flexibility of vinyl is a positive attribute because it allows the fence to flex with the wind and other elements. However, if the vinyl post is not reinforced inside it will actually flex away from a person leaning against it. To counter this potential problem, Vinyl Fence America has been filling our fence posts 4’ above ground level with concrete and 1 to 2 pieces of ½” rebar for almost 20 years. This provides a homeowner with the strength of a wood fence, but the flexibility of a vinyl fence. If you are tired of hearing “no”, or “it can’t be done” from our competitors, give us a call. If we cannot do it in vinyl, no one can. If you want the best product and the best installation in Southern California, Vinyl Fence America is the company to call.